Mid-Continent Railway Gazette is published by the Mid-Continent RHS, and copies may be ordered for $4.95 plus postage and handling. The edition reviewed here was a "special issue," which focused exclusively on one railroad car: Great Northern (GN) business car A-22. Cover from December 2005 Mid-Continent Railway Gazette. The car was built in 1905 by the GN for the use of Louis Hill, VP of the railroad (and son of Jim Hill who built the GN). The Gazette articles start with some general history of the GN, and branches into a more specific history about the Hill family, and Louis in particular. The original conception and building of A-22 is covered in detail, noting the car was originally constructed using a lot of recycled materials from other cars, and with a simpler than usual interior. Louis built this car not only to carry himself and his family, but with provision to carry an automobile which could be loaded through doors stretching almost across the width of one end of the car, and hauled up ramps with a winch. Mid-Continent's researchers also found three of Louis Hill&apos;s automobiles still extant and restored; and given that these vehicles once traveled in A-22, they are overviewed as well. While the car was in Louis Hill&apos;s service it was subsequently altered several times, and these changes are well documented. Eventually A-22 was demoted to work train service, and the history of the car during this period is a bit sketchy. It was used as such by GN until the Burlington Northern (BN) merger, at which time it was acquired from the BN by the Mid-Continent Railway Museum. There is a wealth of information available about the A-22 after its acquisition and subsequent use by Mid-Continent. The museum initially used the car for some time as an office, later preserving it under tarps while evaluating and planning for its restoration; which included fund raising for a coach house to preserve it indoors as well. 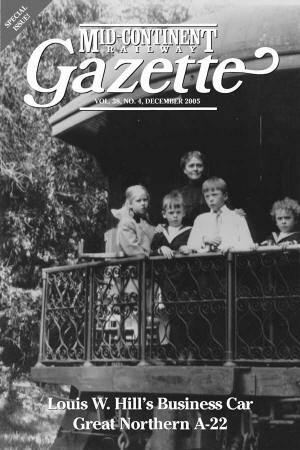 With this edition of the Gazette, Mid-Continent demonstrates its high professional standing not only in wooden car preservation, but as first rate historians and publishers.� It is obvious that considerable time and effort went into researching and documenting this journal, and the quality of the production including the photography and printing is excellent. Regardless, this booklet would make a creditable model for publication from any railroad museum.�	I would recommend other institutions not only acquire a copy of this gazette, but consider using it as a template to produce similar high quality publications of their own.